The University of Colorado Boulder’s Laboratory for Atmospheric and Space Physics (LASP) will conduct mission operations and data processing for the first privately funded deep-space mission, whose goal will be to spot near-Earth objects that could be in a dangerous trajectory with Earth. The mission will be led by the B612 Foundation. The Sentinel mission will place a space telescope built by Ball Aerospace and Technologies Corporation in orbit around the Sun, mapping the current and future locations of objects in the inner Solar System that may cross paths with Earth. Mission operations and data processing for the mission will be led from the LASP Mission Operations Centers—state-of-the-art centers located at LASP on the University of Colorado Boulder campus and staffed with personnel who are on-call 24 hours a day, 7 days a week. 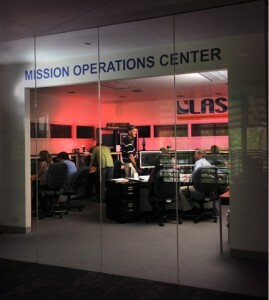 LASP student operators must pass a summer-long course held at LASP to become certified mission operators. Student operators currently work under the supervision of professional staff to operate over $1 billion worth of spacecraft. LASP professionals and student staff currently operate 4 NASA spacecraft, including the AIM, Kepler, SORCE, and QuikSCAT missions, as well as 14 space science instruments. Over the past decade-and-a-half, LASP has been responsible for operating more than 30 spacecraft and instruments from our facilities.